Before sending the first human Yuri Gagarin to space, Russian scientists made a lot of experiments with animals. The most well known are two dogs who were sent in Russian rocket just before the first human made his flight. This launch of the first space pig is less known to public, and in this Year of the Pig according to Oriental calendar, we can commemorate this brave pioneer of Russian space science. 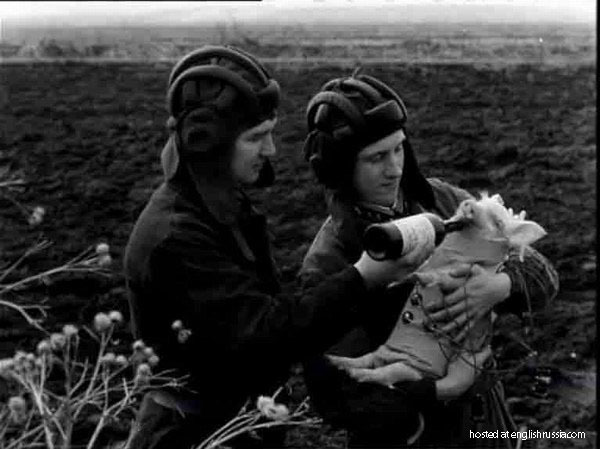 And look how this hero is treaded with humanity – they gave him some wine before the launch in order to bring it in relaxed state. Is this satire? The uniforms look like 1940’s vintage. I think this is real. As real as WWF. ROTFL! I meant the one where rather large pumped up males are acting ip like little kids for the enjoyment of the masses. In soviet russia, Stalin makes you up. Gagarin was not the first person in space. There were others before him, but they all died. So the Russians lied that the Gagarin is the first. He was the first, that returned alive and well. The story with the pig is fake. You can’t send a pig in a space with this funny looking cannon gun. And this is in Russia. I believe that there are many other mission without success in USA and Germany during WWII…. There were not such events and there were not any ‘space mission’ during WWII. German V-1 planes (with rockets engine) were tested by pilots, but there weren’t human pilot testings of V-2 rockets. V-2 was ballistic rocket and worked as ‘launch and forget’. There were German plans of New York bombing by ballistic V-2, with a pointing of the goal made by sabotage soldiers radio. Of course, it was only planes: no accurate range of V-2 flying; no tools to make it. ‘Pig in space’ from this topic it’s fake. I see the funny photos were made not ealier than 40 years ago. And it was to ‘late’ to test ‘launching in space’ by explosions devices. I think the funny photos were made few years ago. On second thought, this may be an experiment about how a living thing can withstand the “G-force” of sudden acceleration. In that sense, it would not be so far-fetched. I made a big big caca this morning. It was long and brown and looked kind of hairy. No bits of food identifiable, tho. Yesterday my caca was much bigger and firmer. I’ve been dropping the biggest dumps of my life this week. It’s been a great week. It’s real! But the pig is fake! are these outtakes from some long lost kubric movie? This footage is take from a russian film called: “First on the moon” or “Pervie na lune”. The film is a mockumentary (a fake documental film). The film is quite enjoyable. the pig is so cute!!! lol random…. Russian space program was always more developed. Samur,you are very right.Soviets and Russians has so many “first” titles in space science and technology.no one can deny Soviets and Russians participation in space program.i have very long list of soviet achievements in space programme.US just try to follow Russian steps and i think US keep continue this trend in future! ! ! !. Swine flew! This is how it all started. And last? ? ? ? I am glad that experience was successful. Protect the Animals.